Farm machinery maker's gasoline-powered stationary unit is an AC generator, air compressor and 170-amp stick welder. 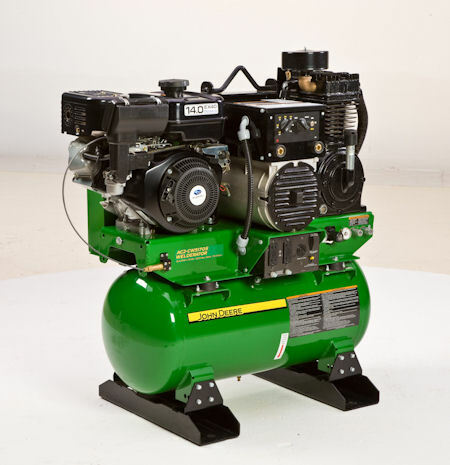 The stationary, gasoline-powered machine provides three functions – air compressor, generator and arc welder – all in one unit. The Welderator features an industrial Subaru overhead cam/overhead valve, 404cc engine with electric start on a powder-coated ASME coded 30-gallon receiver tank mounted on a heavy-duty 3/16-inch base plate that reduces vibration. The unit weighs 585 lbs. empty and is 46 inches long by 22 inches wide and 47 inches high. VERSATILE WORKER: The new John Deere Welderator does the work of an air compressor, generator and arc welder. When operated in generator mode, the unit provides 5000 watts maximum output through two 120V, 20-amp receptacles. Users can select two speeds: idle down for use with the air compressor and full-throttle to power the welder and for electric power generation. The compressor pump is a high-quality two-stage compressor with a splash-lubricated cast-iron crankcase and durable stainless steel braided discharge hose. It is capable of generating airflow at 16.3 CFM at 100 PSI and 15.7 CFM at 175 PSI. In welder mode, the Welderator can produce a 50-170-amp arc suitable for most on-farm welding needs. The duty cycle (10-min. run time) is 150 amps at 100% power.